Jul. 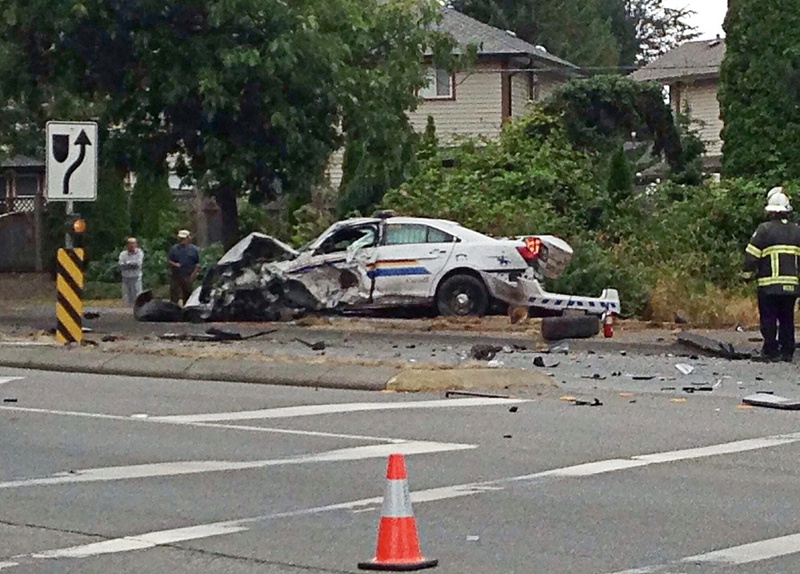 22, 2014 10:00 p.m.
An RCMP cruiser was demolished after a crash in Aldergrove early Tuesday afternoon, injuring a Mountie and three occupants of a van. According to the RCMP, a marked police vehicle was travelling code 3 (emergency equipment activated) in response to an unrelated complaint. The police vehicle collided with a civilian vehicle, according to a statement released by the IIO. The incident took place around 1:30 p.m., in the 26800 block of Fraser Highway. Multiple firehalls and other emergency responders were dispatched to the collision. An Air Ambulance helicopter landed at at nearby Parkside Centennial Elementary, and took the RCMP officer to hospital with non-life threatening injuries. The officer is expected to be released from hospital as early as Tuesday night or Wednesday morning, according to Const. Craig Van Herk of the Langley RCMP. Three of the van’s occupants were also taken to hospital . A nearby resident was outside her home beside Fraser Highway at the time heard the sirens then the crash and felt the impact. She went to the scene and said there were members of the public helping at both vehicles before emergency crews arrived and took over. The van was on its passenger side and people were standing on top of it, prying the door open to get a family out. She said the van was from Alberta and its occupants were a man, woman, young teen boy and little girl. The witness said the RCMP officer seemed to be the most injured and the debris field was very large. Fraser Highway was closed to traffic for several hours around the scene of the crash. On Wednesday, the Langley RCMP publicly thanked the members of the public who helped at the crash scene. â€œWe are aware that many citizens stepped up and assisted both our officer and the civilians at the scene before emergency services arrived,â€ said Insp. Rob De Boersap. â€œWe are grateful to them for jumping in as they did and relieved that none of the injuries were as serious as first thought. The Independent Investigations Office of BC (IIO) will lead the investigation into the serious crash because it involved a police officer. The Langley RCMP are responsible for investigating the actions of the civilians while the IIO has jurisdiction over the investigation into the actions of the RCMP officer. The IIO said it is not releasing anymore information at this time as the investigation is in its initial stages.